Brazed plate heat exchangers from Danfoss are tailored for refrigeration and air conditioning systems, and can be customized for specific application requirements. Each heat exchanger consists of a series of thin, corrugated metal plates that are brazed together to improve heat transfer efficiency. The plates are compressed together in a rigid frame to create an arrangement of parallel flow channels, in which one high-viscosity fluid travels through the odd-numbered channels, and the other high-viscosity fluid flows through the even. 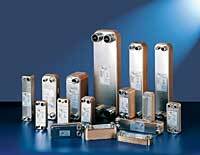 The company offers 15 brazed plate heat exchanger models. Each model is compactly designed and combines high efficiency with energy-saving qualities. Model B3-048 is designed with different corrugation depth on the same plate. With a capacity of 30 â€“ 80 kW, this model allows a larger water flow rate, lower pressure rate drop and lower refrigerant charge. Model B3-260 is designed for use with HVAC and chillers. And, for air driers and chillers, Danfoss recommends models B3-014, B3-027 and B3-136. The entire range of brazed plate heat exchangers can also be used for heat pumps, economizers, de-superheaters and numerous other applications.